During my mentoring it became clear that we needed a ready supply of blank forms for the common tasks our clients undertake. These include statutory declarations, affidavits, land titles and guardianship forms amongst others. While the signing centres should hold a stock of these forms I found it pays to have your own copies if only for reference purposes. 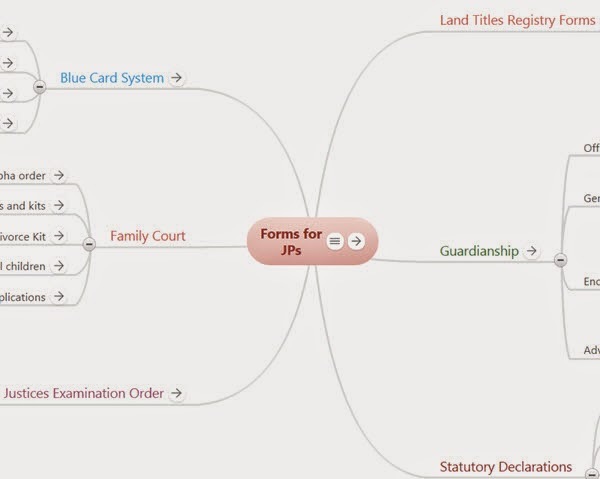 Being a fan of the Mindmeister site I set out to collect links to many of the standard forms as an online mind map. My JP colleagues asked for copies so I simply set my Forms for JPs map to allow public access. Find the JP Forms Collection link on the right of this page. When you open the map drag the mouse on the background to move the map around and click the + and - symbols at the top left to zoom in or out. Note that if you move your mouse over an arrow symbol on any node a popup box appears with the external link which you click to open the relevant page/form. In a similar way hovering over the symbol with lines brings up a note attached to that node, see the centre node note for example. Don't forget to send me suggestions for additional forms you would like to see added. As well let me know if any of the links are broken since they all point to public web sites that change over time.